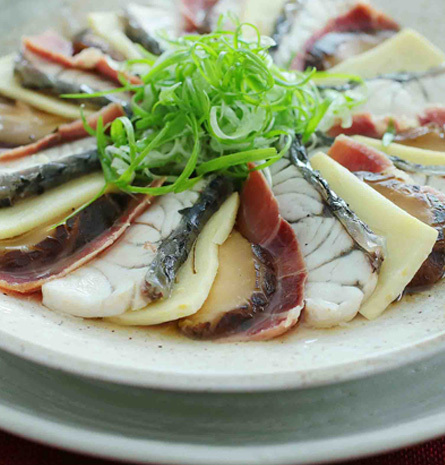 Slice bamboo shoots and mushrooms to 0.5cm thickness. Slice Chinese ham as thinly as possible. In a bowl, mix all the seasoning ingredients well. Blanch sliced bamboo shoots for 4 minutes. Sprinkle Chinese rice wine on the Chinese ham and steam for 5 minutes. 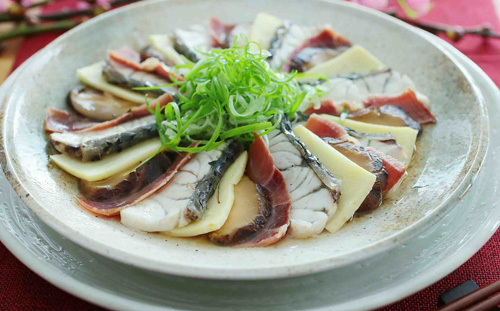 In a steaming platter, arrange sliced fish, Chinese ham, mushrooms and bamboo shoots in an alternating fashion. Repeat till it completely encircles the steaming platter. Spoon the seasoning sauce over. Steam for 4 minutes, or till the fish is cooked. Heat up groundnut oil till smoking hot. Pour over the fish and serve immediately.